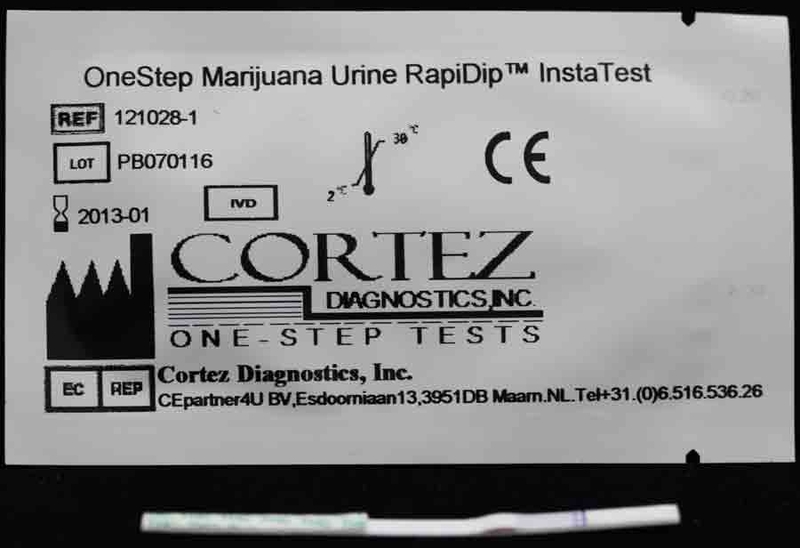 Los Angeles based Diagnostic Automation/Cortez Diagnostics, Inc., maker of high-end rapid diagnostic tests, offers a 4 Panel Drug Test for any combination drugs: (AMP) Amphetamine drug test, (BZD) Benzodiazepine drug test, (COC) Cocaine drug test, and (THC) Marijuana drug test. This multi-drug test kit includes all needed drug testing supplies and is designed for qualitative determination of drug substances in human urine specimen. 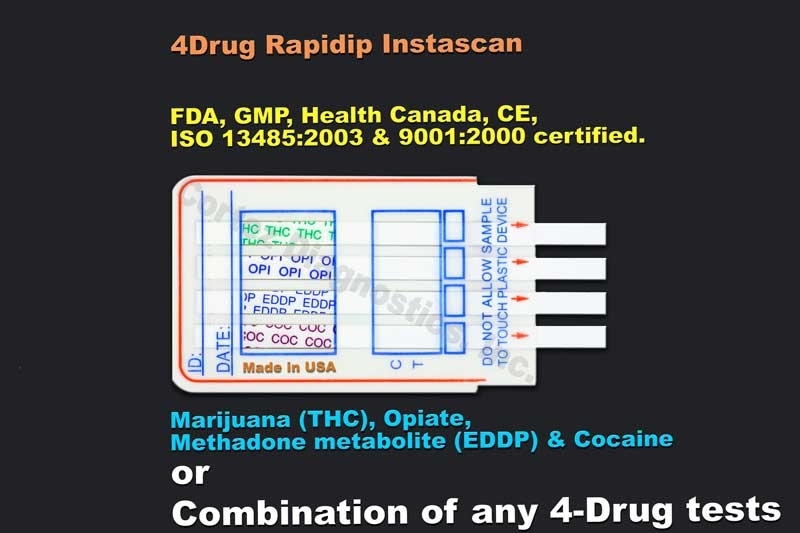 The four panel - (AMP) Amphetamine drug test, (BZD) Benzodiazepine drug test, (COC) Cocaine drug test, and (THC) Marijuana drug test device is based on the principle of specific immunochemical reaction between antibodies and antigens to analyze particular compounds in human urine specimen. The assay relies on the competition for binding antibody between drug conjugate and free drug which may be present in the urine specimen being tested. When the Amphetamine (AMP), Benzodiazepine (BZD), Cocaine (COC), or Marijuana (THC) drug is present in the urine specimen, it competes with drug conjugate for the limited amount of antibody-dye conjugate. When the amount of the Amphetamine (AMP), Benzodiazepine (BZD), Cocaine (COC), or Marijuana (THC) drug is equal or more than the cut-off, it will prevent the binding of drug conjugate to the antibody. 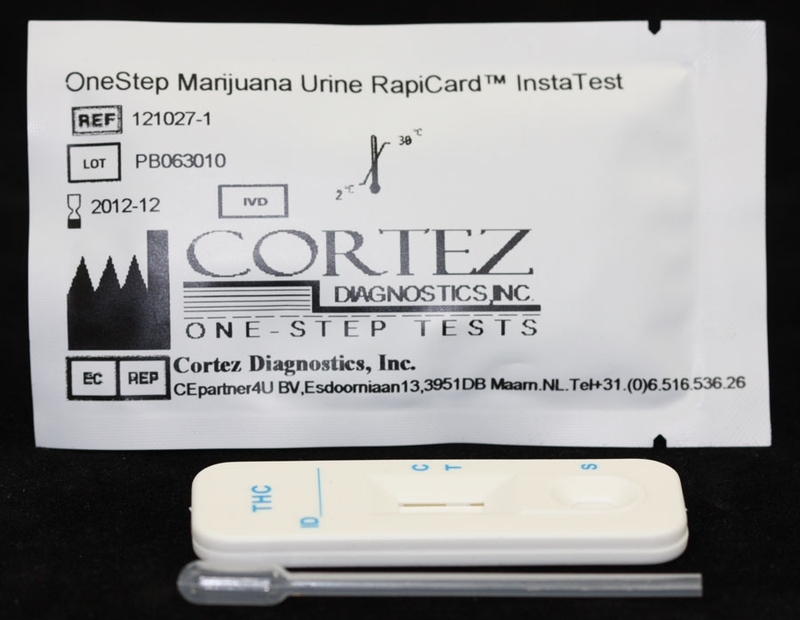 Therefore, a positive urine specimen on the 4 panel drug test - (AMP) Amphetamine drug test, (BZD) Benzodiazepine drug test, (COC) Cocaine drug test, and (THC) Marijuana Drug Test will not show a colored band on the test line zone, indicating a positive result, while the presence of a colored band indicates a negative result. A control line is present in the test window to work as procedural control. 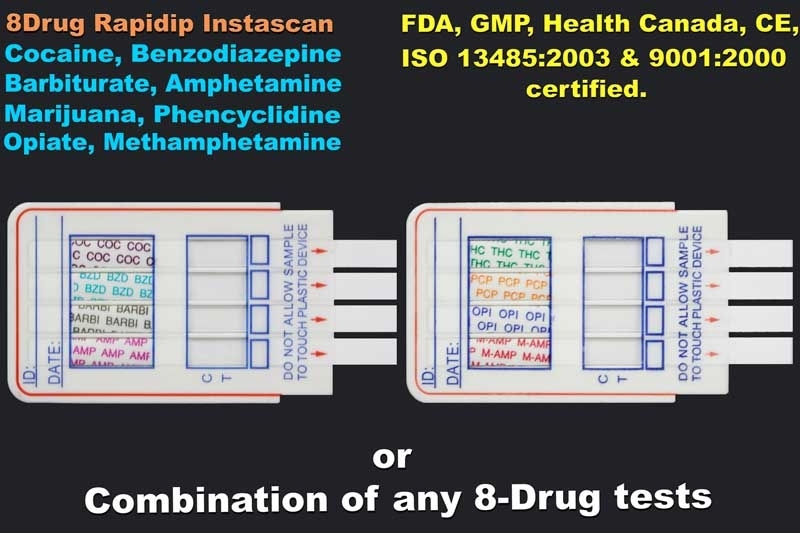 This colored band should always appear on the control line zone if the 4 panel drug test -(AMP) Amphetamine drug test, (BZD) Benzodiazepine drug test, (COC) Cocaine drug test, and (THC) Marijuana drug testing device is stored in good condition and the 4 panel drug test - (AMP) Amphetamine drug test, (BZD) Benzodiazepine drug test, (COC) Cocaine drug test, and (THC) Marijuana Drug Test is performed appropriately. Amphetamines are a class of potent sympathominetic agents with therapeutic applications. The most common amphetamine drugs are d-amphetamine and d,l-amphetamine. Amphetamines are central nervous stimulants that cause the neutrotrransmitters epinephrine, norepinephrine and dopamine to be released into the brain and body giving users feelings of euphoria, alertness, and increased energy. Chronic abuse of amphetamine drugs leads to tolerance and drug reinforcement effect. Cardiovascular responses to amphetamine drugs include increased blood pressure and cardiac arrhythmias. More acute responses to amphetamine drugs produce anxiety, paranoia, hallucinations and psychotic behavior. Amphetamine drugs are metabolized by a number of pathways. In general, acid urine promotes excretion whereas alkaline urine retards it. In 24 hours, approximately 79% of the amphetamine drug dose is excreted in acid urine and about 45% in alkaline urine. Typically, about 20% of the amphetamine drug is excreted as unchanged amphetamine. Unchanged amphetamine can be detected up to 1 to 2 days after use. The cutoff for this 4 panel amphetamine drug test is 1000 ng/ml of d-amphetamine. Cocaine (COC) is derived from the leaves of the cocoa plant. The cocaine drug is a potent central nervous system stimulant as well as a local anesthetic. Some of the psychological effects induced by the cocaine drug are: euphoria, confidence and a sense of increased energy, accompanied by increased heart rate, dilation of the pupils, fever, tremors and sweating. Continued ingestion of the cocaine drug could induce tolerances and physiological dependency which leads to its abuse. The cocaine drug is used by smoking, intravenous, intransal or oral administration and excreted in the urine primarily as benzoylecgonine in a short period. Benzoylecgonine has a biological half-life of 5 to 8 hours, which is much longer than that of the cocaine drug ( 0.5 to 1.5 hours), and can be generally detected for 12 to 72 hours after cocaine drug use or exposure. The cutoff level for this 4 panel cocaine drug test is 300 ng/ml of benzoylecgonine. The agents of the Marijuana Drug (THC) that cause various biological effects in humans are called cannabinoid. Cannabinoid is a central nervous stimulant that alters mood and sensory perceptions, produces loss of coordination, impairs short term memory, and produces symptoms of anxiety, paranoia, depression, confusion, hallucination, and increased heart rate. Large doses of cannabinoid could cause the development of tolerances and physiological dependency and lead to abuse. A tolerance to the cardiac and psychotropic effects of the marijuana drug can occur and withdrawal syndrome produces restlessness, insomnia, anorexia and nausea. αÂ�£9-THC is the primary active ingredient in cannabinoids. The main metabolite excreted in the urine is 11-nor-αÂ�£9-THC-9-COOH, which are found within hours of exposure and remain detectable in the urine for 3-10 days after smoking. 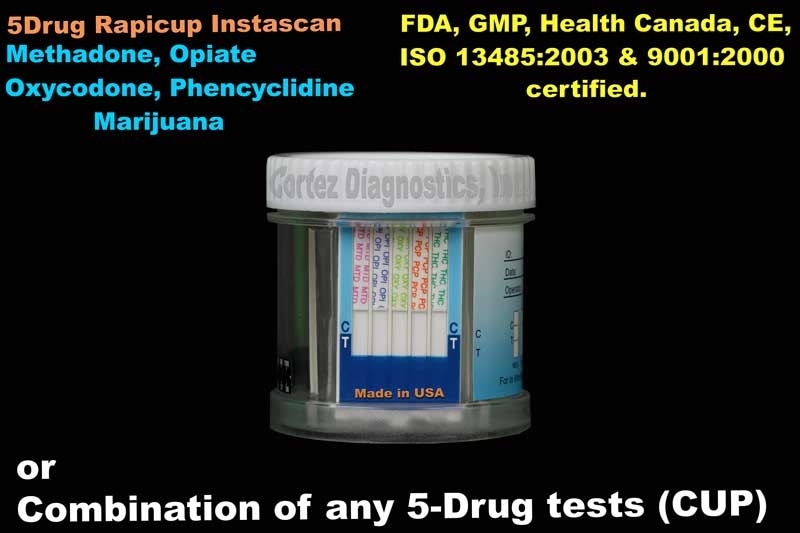 The cutoff level for this 4 panel marijuana drug test is 50 ng/ml of 11-nor-D9-THC-9-COOH. The optional built-in Adulteration Test is for validation of urine specimens’ integrity and must not be used for In Vitro diagnostic use. For customized cutoff levels for any multi panel drug tests, please contact Customer Service. 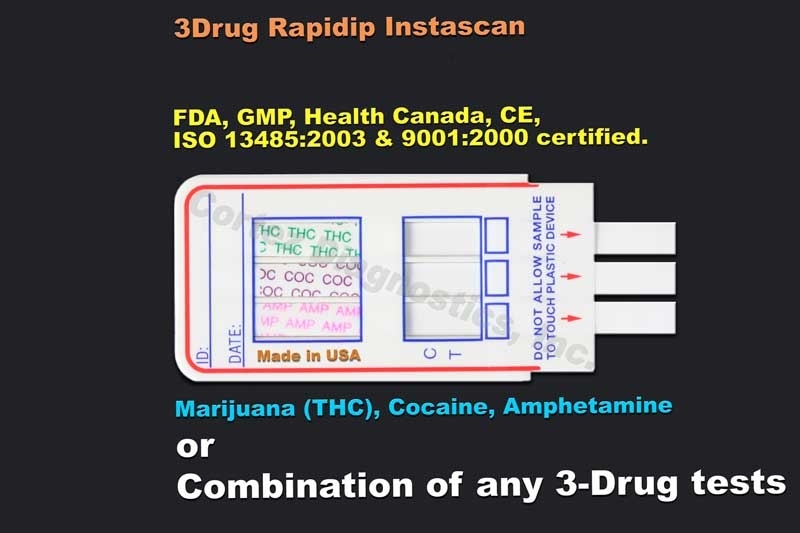 This 4 panel drug test - (AMP) Amphetamine drug test, (BZD) Benzodiazepine drug test, (COC) Cocaine drug test, and (THC) Marijuana Drug Test is available in cassette, strip, or cup format.